Credit: Robert Hurt (Spitzer Science Center), JPL-Caltech, NASA. The fastest star ever seen in the Milky Way's ancient halo may boost estimates for our Galaxy's mass, say German astronomers. In order for its gravity to hold on to such a speedy star, the Milky Way must have roughly 2 trillion times more mass than that of the Sun. The Milky Way boasts hundreds of billions of stars, but most of its mass is in the enormous--and invisible--"dark halo" that engulfs the bright Galactic disk to which the Sun belongs. 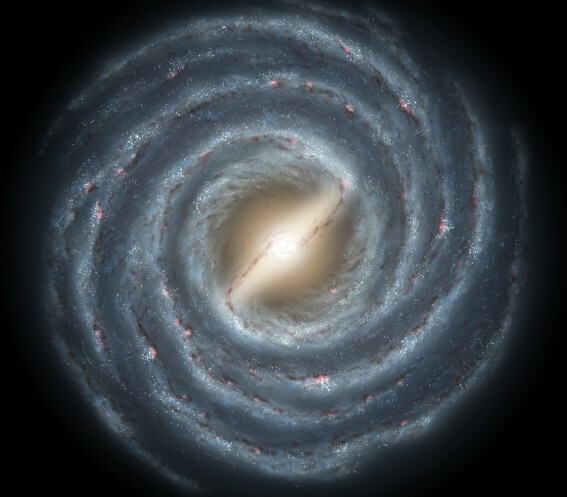 Thus, the Milky Way's exact mass is unknown, with most estimates ranging from 1 to 2 trillion solar masses. Now Norbert Przybilla, Alfred Tillich, and Ulrich Heber of Dr. Karl Remeis Observatory in Bamberg and Ralf-Dieter Scholz of the Astrophysical Institute in Potsdam argue that the higher figure is probably correct. They studied a star called SDSS J1539+0239, which is racing toward us in the constellation Serpens. This is a horizontal-branch star, which means that it is in a more advanced stage of evolution than the Sun. Whereas the Sun generates energy by converting hydrogen into helium, this star converts helium into carbon and oxygen. The team determined the star's three-dimensional velocity by first working out three parameters. The first, and easiest, is the star's Doppler shift, which reveals how fast the star moves towards Earth. Xiangxiang Xue of the National Astronomical Observatories in China and colleagues reported this two years ago to an accuracy of 2 percent. Przybilla's team then measured the second quantity: the star's proper motion, which is the apparent movement, year after year, across our line of sight. By looking at the star's changing position on photographic plates taken in different years, the astronomers determined the proper motion to an accuracy of about 20 percent. The third, and most difficult, quantity is the star's distance, which the astronomers estimate is 39,000 light-years--plus or minus 20 percent. Together with the proper motion, the distance reveals the speed at which the star moves across our line of sight. "It was immediately clear that this star must be something special and interesting," says Przybilla. Relative to the Galactic center, the star is racing through space at roughly 694 kilometers a second. That is three times faster than the Sun and about 60 kilometers a second faster than the previous halo star speed record holder. Indeed, the only stars faster are "hypervelocity" stars, shot out of the Galactic center by interactions with the Milky Way’s central supermassive black hole. But such stars may no longer be bound to the Galaxy, so they don't constrain its mass. By contrast, the star in Serpens is probably native to the halo. "It is coming towards us," says Przybilla, "so the probability that it belongs to the Milky Way is very high." The star's high speed means that the Galaxy must have at least 1.8 trillion solar masses or else the star would have escaped the Galaxy's grasp. This mass estimate agrees with studies of galaxies orbiting the Milky Way, but it is twice as high as the figure that Xue's team reached after studying Doppler shifts of halo stars. "The result is interesting and important," says Scott Tremaine, an astronomer at the Institute for Advanced Study in Princeton, New Jersey, who was not involved with the work. However, he does have concerns: "Most of the reason they're getting this very high velocity for the star is because of the component across the line of sight," he says. And that is where the greatest uncertainty lies. Fortunately, help is on the way. In 2012, the European Space Agency will launch Gaia, a satellite to measure precise motions and distances for a billion stars, including the one in Serpens. Says Przybilla: "Gaia will be a revolution in our view of the nearby universe." The astronomers will report their work in The Astrophysical Journal. Ken Croswell earned his Ph.D. for studying the Milky Way's halo.